Prepare coffee rub by combining first 8 ingredients in medium bowl. Crush any lumps of sugar or cocoa, to create a fine blend. May be made in advance, kept in a tight jar, for up to 4 weeks. 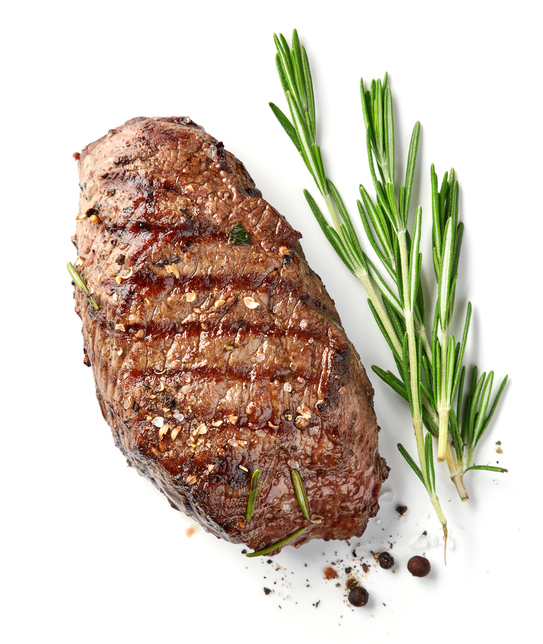 One hour before grilling steak, allow meat to sit at room temperature. Brush surface of each steak with olive oil before rubbing with coffee mixture. Place steaks on hot grill, and cook until desired doneness, at least 5 minutes per side. Internal meat temperature should read between 140F and 180F. Let meat rest before serving, ideally in a pan so that juices may gather. Serve by slicing if desired, and pour pan juices over meat. If you, or those you love, love steak ... do I have a recipe for you. Today I spent several hours cheffing at a grill promotion event, on nice hot concrete in the bright sunshine. There were six stations for grill fans to visit, and taste innovative creations like BLT sliders with spicy apricot sauce, salmon with maple-ginger glaze, and even peach cobbler made in a Dutch oven on the grill. At our grill station ... I have to say, my watermelon-grilled-cheese pizza and cinnamon doughnuts with strawberry and cream were mega-crowd-pleasers (stay tuned for those summer recipes in the weeks to come)! And, people were crazy-impressed with the steak I grilled, rubbed with this spicy coffee mix. This recipe has rendered rave reviews since I was the Bar chef, and I’ve served it at parties ever since. Most recently, Lisa and I catered a post-wedding reception for a lovely Brazilian bride and her new husband. One of her first requests was for serious meat, since Brazilians love high-quality meat, she promised and, I knew that ;-). Grilling “serious meat” accordingly was both a joy and pleasure, since her in-laws hosted the party at their home on the beach and, my coffee rub happens to includes cocoa, honoring a Brazilian influence. It was a big hit and a fantastic party. Some tips for this undertaking - which is practically guaranteed to send your guests home reeling with that same rapture - include the following. 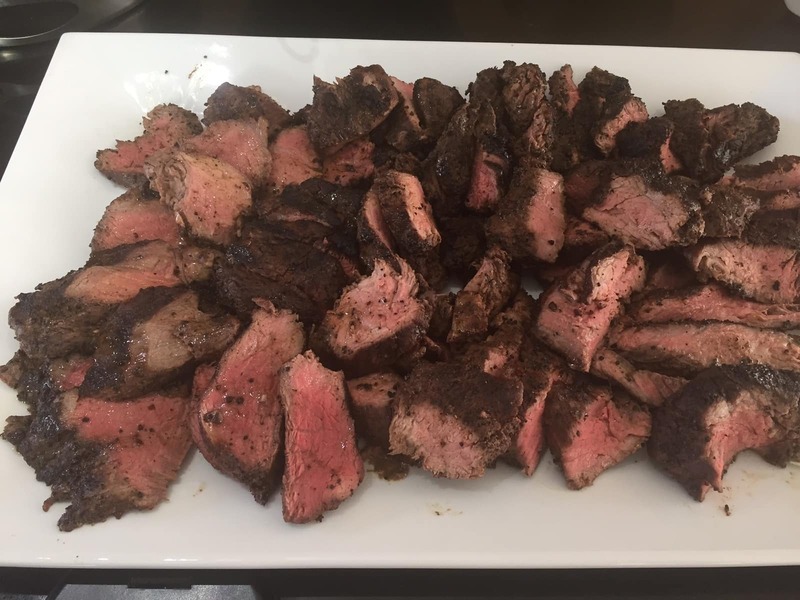 I’ve used both tenderloin and tri-tip (the original inspiration, for sliders) beef, and both are recommended. The recipe below is fine for either choice, especially if you have your butcher (like my darlings at Huntington Meats) slice the tri-tip roast into 1” slices. Coat all sides of the meat with the rub before grilling if possible. This will yield an almost-caramelized crust around tender meat that just about melts in your mouth. Aleppo pepper is my favorite red pepper, but you may use cayenne or any other red pepper that you prefer. I use a dark French-roast coffee, and I grind the beans just before mixing the rub. Be sure to take your meat to room temperature before brushing with olive oil, then coating with the rub ~ a secret to its success! The dark, earthy ingredients in this rub mix are really designed to make beef ... simply extraordinary. I think you’ll agree and I am quite sure your loved ones will feel so appreciative - and lucky - that you shared this delicious gift with them.